Hello friends! 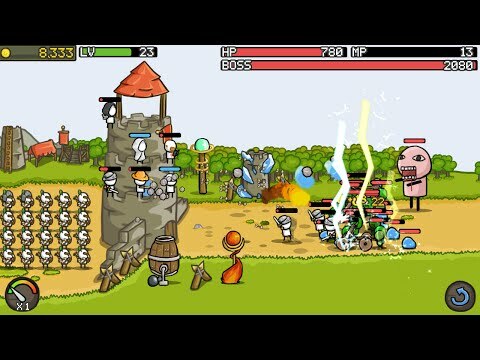 Today I will be discussing the amazing tower defense game called the Grow Castle. This game is developed by Raon Games and is pretty famous among gamers. Today we will review this game and will tell you about how this game is. We will also share some grow castle cheats with you too. With these cheats, you will be able to rule this game easily. So, let’s get started. But before that, I would advise you to read our previous article on this game on Grow Castle game tips and tricks. So, let’s start with the review of this grow castle game. A useful tip to win over Grow Castle app game is to take over towns. By winning over towns that you come across in the game, you stand a chance to win free gold. Not many gamers are aware of this interesting feature, but did you know that gold can be won passively every minute in exercising this option? For this, all you need to do is tap a little map icon. Once you do this, you’ll be taken to the world map where you’ll find 18 towns with different ratings. Your aim has to be in defeating the enemies present in those towns and capture the castle that opposes your moves. Once you have all enemies defeated and have taken over castles, you’ll be rewarded with gold. And now let`s get to the gameplay review. The gameplay is simple and easy to execute. But you need to keep a close eye on ads that keep popping up when you start playing this android game. This is because the more you watch these ads; higher are your chances of winning free gold. As and when you start playing Grow Castle, click on the popup ‘Earn X Gold’ that appears at regular intervals, usually after every wave, and then sit through the ad to win your gold. What is really good with this trick? You have the option to chain these gold rewards. What this means is that you can keep collecting gold rewards one after another and use it to your advantage, at a later stage. For example, if you start collecting 2,000 gold rewards after watching the first 20 seconds ad then there are chances of you collecting 20,000 after watching a few more ads! The game is pretty basic. Here are the best tips we can find on the web for Grow Castle and enjoy! First Upgrade your heroes such as Witches, Zeus and Druid. Then you need to capture a lot of colonies you will get more money as you continue capturing. Watch some ads they will help you to get more money. Always Upgrade the Town archers it’s very important! Don’t Spend your XP fast. Don’t waste money on mana or skills you will eventually dry fast. Wait till wave 99 you will have to upgrade. Promote your heroes whenever you can. This is a nice and simple game and you can try it, it might be your style of game.